From left: Daniel Mendez, Collin Gualip and Manuel Pop Sun were sentenced to 6,060 years in prison for military murder. NEW: State media describes the ruling as an "historic sentence"
Guatemala City (CNN) -- A Guatemalan court convicted and sentenced four former soldiers Tuesday to more than 6,000 years each in prison for their role in a massacre of 250 people during the country's civil war, state media reported. 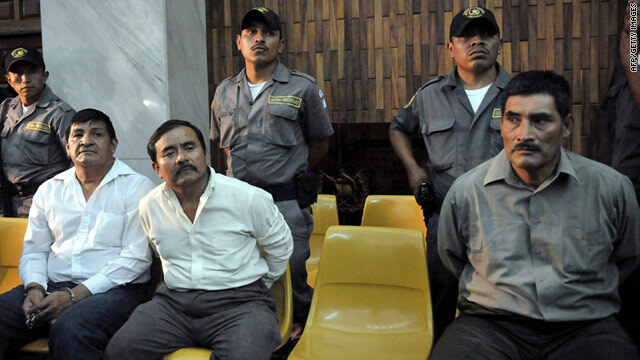 The trial was one of Guatemala's first against dictatorship-era ex-soldiers. The state-run AGN news agency described the ruling as an "historic sentence." Family members and activists hailed the news, and said they hoped it would set a precedent for future legal action. "This sentence we heard today is only the beginning," said Aura Elena Farfan, director of the Association for Relatives of the Detained-Disappeared. The four soldiers on trial -- Carlos Antonio Carias Lopez, Reyes Collin Guali, Daniel Martinez Mendez and Manuel Pop Sun -- pleaded not guilty. They were convicted of crimes against humanity for their role in 201 of the killings that occurred during the 1982 massacre at the village of Dos Erres, located in the northern Guatemalan province of Peten. "I have said several times that I am innocent ... There is no solid proof," Carias told CNN affiliate Noti7 before the ruling. The United Nations documented 669 massacres in Guatemala during the nation's 36-year civil war, which ended in 1996. More than 23 witnesses testified during the trial, including former members of the military. During the trial, survivors described what they witnessed during the brutal massacre and villagers testified about the disappearance of their families at the hands of the army, according to the state-run AGN news agency. Petronila Lopez Mendez, 65, told the court that she lost her husband and two teenage sons in the massacre, and she accused Carias of withholding information about their whereabouts in the aftermath of the incident, AGN reported. She testified that she paid Carias money in exchange for her family, but they never reappeared. Another witness was Felicitia Helenia Ramirez, who lost her parents in the massacre and said that when she sneaked back into the village, she found it burned to the ground, AGN reported. "What I found was clothes strewn all over the place ... the only thing that I took with me was a photo of my mom," she said. Family members of victims cried out as Judge Patricia Bustamante read the sentence Tuesday, AGN reported. Many of them held red carnations in their hands. An emotional elderly man knelt in the courtroom after Tuesday's ruling, according to the state news agency. "Justice has finally been done," he said. Journalist Patzy Vasquez and CNN en Espanol's Patricia Janiot contributed to this report.